Yesterday afternoon, the Yankees got bad news about Greg Bird’s latest injury. He has a broken bone spur in his right ankle and will have surgery later today. The Yankees say Bird is “expected to rehab for 6-8 weeks before returning to game action.” Sigh. Anyway, I’ve got thoughts on the injury and the first base situation, so let’s get to it. I had a feeling bad news was coming when Brian Cashman said Bird first felt the discomfort in his foot after playing nine innings in a game last week. He didn’t foul a pitch into his foot like last year or anything like that. It was a non-contact injury. Those are never good. I suppose the good news is Bird doesn’t have tendon or soft tissue damage. It’s a bone spur. They go in, take and out, and that’s that. I just hope this year’s injury and last year’s injury are two independent injuries and not a sign Bird is headed for chronic foot problems. Those can be career-ruiners. 2. One thing to keep in mind: Bird said he would come back and contribute last season when pretty much everyone — including some dopey “Yankee insider” who questioned whether Bird even wanted to play (remember that?) — assumed his season was over following surgery. “My season is not over. I plan to do everything in my power to return and help our team win in 2017,” he said in a statement, specifically. And he did! Bird came back in August, shook off the rust, and contributed down the stretch and into the postseason. Hopefully he can do the same this year. Bird didn’t try to play through the injury this year — Cashman said Bird first felt discomfort last week and he reported it a day or two later — and with any luck, that’ll speed up his recovery. He’s having the surgery now, before Opening Day, and the 6-8 week timetable puts him on track to return in mid-May. With any luck, Bird will come back like he did last year and contribute when pretty much everyone doubted him. 3. For the time being, Tyler Austin and Neil Walker at first base is the way to go. Walker against righties, Austin against lefties. Straight platoon at first base. Make a phone call to see whether Adam Lind has interest in returning — I imagine he’ll need some at-bats before jumping into MLB games — otherwise “this time of year, this is what you do, you go with what you got,” as Cashman said to Billy Witz. Walker hits righties, Austin at least has power against lefties, and maybe Lind returns and can be a factor as a lefty platoon bat (his first base defense is terrible though). 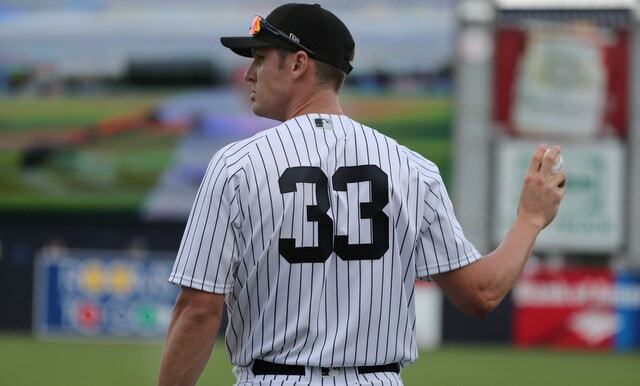 I imagine Billy McKinney will see more time at first base in Triple-A, meaning he is the depth player right now. Perhaps Miguel Andujar can be an option there after more exposure to the position in Triple-A. All things considered, a Walker/Austin platoon in the short-term isn’t the worst thing in the world. It’s certainly better than going with Austin Romine and Rob Refsnyder at first base like the Yankees did at times last season. Cashman will check around for first base help because that’s what every GM would do in this situation. It’s a little too early in the season for trades though. Not mean teams are willing to start wheeling and dealing yet. Walker and Austin with McKinney and possibly Andujar in reserve is the answer right now. 5. And finally, is it weird that I don’t think losing Bird for the next 6-8 weeks is a devastating loss? Don’t get me wrong, I’d rather have Bird in the lineup than Not Bird in the lineup. It’s just that Bird was only going to be one piece of a very good and very deep lineup. This isn’t like removing Robinson Cano from the 2013 lineup, you know? The Yankees are still going into the season with Aaron Judge, Giancarlo Stanton, and Gary Sanchez as the centerpieces of the offense. Walker, Brett Gardner, Didi Gregorius, and Brandon Drury are fine complementary pieces. Better than average complementary pieces, I’d say. The Yankees scored the second most runs in baseball last year even though Bird was mostly a non-factor, and they still figure to have an excellent offense with him sidelined this year. Someone got hurt. It happens. The Yankees are plenty good enough to overcome it.